Suguru Hiraide was born in Nagano prefecture, Japan, in 1969. After he graduated from high school, he moved to Tokyo in 1988. He came to the U.S. to attend college in 1992. He received his BFA in Sculpture and Graphic Design from West Virginia University and his MFA in Sculpture from California State University, Fullerton. 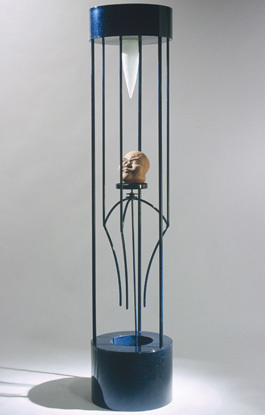 Many of his sculptures are kinetic combined with cast materials such as aluminum, silver, and bronze. His recent exhibitions include; As We Glow Forward, Museum of Neon Art, Los Angeles, CA (2006); The 5th American & Japanese Artists Exchange Show, Kitakyushu Municipal Museum of Art, Kitakyushu, Japan (2005); Mix! Series, The Dallas Center for Contemporary Art, Dallas, TX (solo, 2005); re–ACTION, Art League Houston, Houston, TX (2005); and epitome II, LA Artcore gallery in the Union Center for the Arts, Los Angeles, CA (solo, 2004). Since 2003, he has been teaching Sculpture and Metals at Midwestern State University in Wichita Falls, Texas. Unlike the stereotype of the height of most Japanese, he is 6’4” (193 cm).